There’s a few things tangled up in here, but let’s see if we can untangle them. Or you might have run into the explanation that gravity acts like a bowling ball on a rubber sheet, with heavier objects causing deeper indentations in the sheet. These are reasonable explanations, though simplified, since the indentations happen in all directions, so these ‘indentations’ are really three dimensional distortions, or condensations, of space itself. But these simplifications illustrate an important point — fundamentally, gravity is a distortion to space itself. Often we speak of this distortion in terms of a ‘well’, which goes back to this two dimensional sheet metaphor, since it’s easy to think of things rolling downhill into a divot, formed by the presence of a large amount of mass. Mathematically, the influence of gravity is written out as directly proportionate to the mass of the object, and inversely proportional to the square of the distance between you and that object. This distance dependence is what creates the particular smooth curve away from the center of the object. If you’re very close to the object, the gravitational well is deep, and you feel a strong gravitational pull. If you’re further away, gravity can’t pull space that far out of shape, so you feel a much weaker gravitational force. These distortions to space are always present — for instance, all the planets are in their own distortion of space, with moons that float in ellipses within this distortion. The Sun has its own, much deeper distortion that all the planets are circling. The Sun follows the distortion of the galaxy. And, critically, each distortion was present in a milder form before each of these objects collapsed into their current form, so these distortions didn’t spontaneously form at any stage — they simply contracted and deepened as density increased. A small gas cloud could have the same mass as a small planet, but the planet’s gravitational well will be steeper than the gas cloud’s. 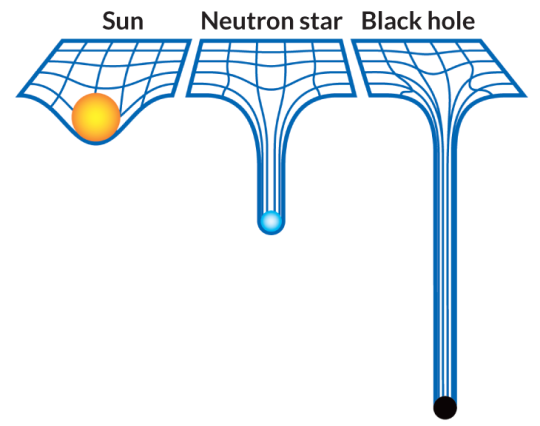 The steeper the gravitational well, the faster you need to go to escape it, but you need both extreme mass and extreme concentration of that mass before you make it to black hole territory. The event horizon of a black hole, in this context, describes the location beyond which, the black hole’s gravitational well is so steep, that even light can’t escape it. If you take one of these rubber sheet diagrams, you could place down a circle to describe it’s location. But the event horizon itself doesn’t describe a physical boundary to the influences of gravity. The gravitational well itself exists continuously outside and inside of the event horizon — outside of the event horizon it’s just slightly less steep. You could place another circle outside the event horizon that describes the location at which you need to go half the speed of light to escape — there’s no change or boundary in the physical distortion at this circle, it’s just a descriptive line that might prove useful to understand or describe the object’s influence on space. The stars which eventually turn into black holes are the most massive stars that form, which tend to burn bright blue, extremely hot, and burn out quickly. 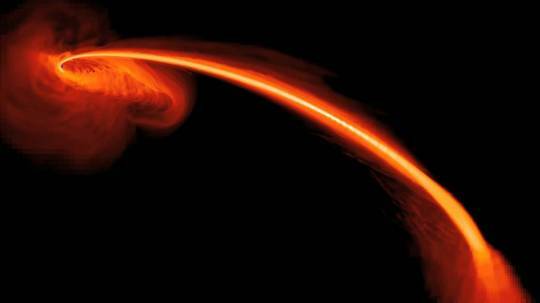 Typically the threshold for the mass of the star that can leave behind a black hole is given at around eight solar masses, though this is probably a slightly fuzzy boundary. 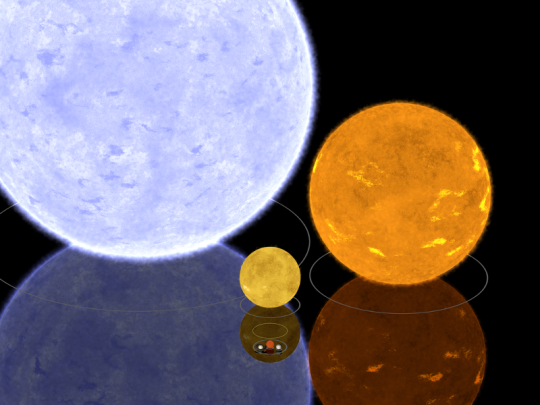 These stars have had their own gravitational distortion since they were a cloud of dense gas, well before they were stars. The stars contract, and light up, and their gravitational twist of space gets more intense, but it’s not a sudden change. It’s more of a gradual shift towards a more and more dramatic gravitational well. The ‘movement’ of gravity at the speed of light limit can be considered entirely separately; while gravity has a broad extent across a wide swath of space, the speed of light imposes a limit on how quickly information about changes can travel across that space. The common example is that if the Sun were to spontaneously vanish — not explode, but vanish completely — the Earth wouldn’t notice anything different until about 8 minutes later, when the sunshine would vanish. But the Earth would also continue to orbit around the physically nonexistent Sun for another 8 minutes, because the changes to the distortion of space due to the Sun’s presence also haven’t reached us yet. If you think of the speed of light more as an information speed limit than as a particle speed limit, this makes it slightly easier to think about. Information doesn’t always travel at the speed of light, though — depending on the environment that the information is traveling through, and the form of that information (which is not always light), the speed of information can proceed at speeds that are much slower than the speed of light. The speed of light in a vacuum seems to be a hard upper limit that nothing can surpass, but if your information is in the form of a compression wave, like sound, then the information travels at the speed of sound in that medium. Think of a lightning strike — unless you’re right underneath the strike, you hear the thunder several seconds after the lightning strike. Light travels faster through air than sound does, so even though they were created at the same time, it’s the light’s information that reaches you first, and this discrepancy grows the further away you are. The speed of light in water is even slower than through air (1.3 times slower, in fact). Effectively, the more dense the material you’re working with, the slower information goes through it. 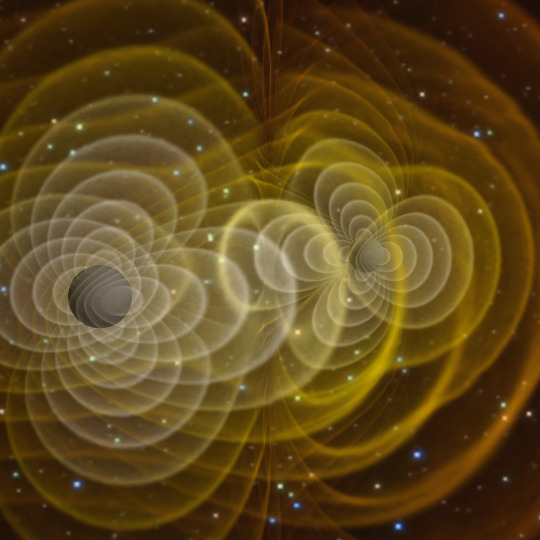 Going back to black holes, changes to the shape of the gravitational distortion are also information traveling through a medium, though the medium of space is generally almost a perfect vacuum, so we’re working close to our absolute speed limit. 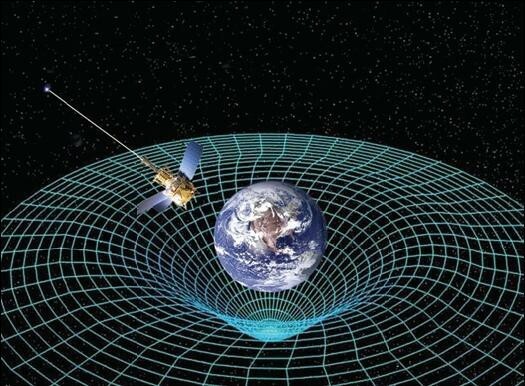 As far as we know, gravity doesn’t function in a way that would slow it down in a vacuum, so it should also pass along information at the speed of light. Gravity is one of the least fundamentally understood forces of nature; we have a very good descriptive understanding of when we expect it to be important, and a very accurate description of its strength, but we don’t know exactly how it functions. How does it interact with matter? Is there a particle mediating its interactions? We have to wait a bit longer to answer these questions, but hopefully we’ll have better answers as we build detectors able to observe tiny fluctuations in the gravitational field that surrounds us!